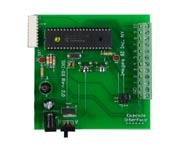 The X10 Speech Recognition Interface SRI-04 is an interface board for the SR-06 and SR-07. 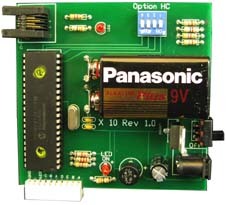 The circuit allows the speech recognitiion kit to output On-Off commands via a X10 Power Line interface (PL513). The Interface can control up to 16 Appliance Control Modules (X10) on any of the 16 available house codes. 1) Standard - one active output at a time. The SRI-02 has ten numbered (1-10) relay switches. Each relay corresponds to a target word. Each numbered relay has a single-pole double-throw (SPDT) switch rated at 125 VAC at 0.5 amps or 24 VDC at 1.0 amps. Using this interface easily allows the speech recognition kit to activate or deactivate 10 electrical circuits or devices. The SRI-01 connects the Speech Recognition Kit (SR-06 or SR-07) to the OWI-535 Robotic Arm. This allows control of the robotic arm functions using voice commands. Each function is controlled by a spoken word. The user trains the speech recognition circuit to recognize their voice and commands. Users may select their own words to control robotic arm function.